Victory! The “Oh Wow” treats strike again. 1. Preheat oven to 350°F, and grease an 8-inch square baking pan. 2. For the brownies – Heat butter and chocolate in a medium-sized saucepan over medium-low heat, whisking occasionally, just until melted. Remove from heat and whisk for a minute or so, until slightly cooled. Using an electric mixer, stir in the sugar, eggs, and vanilla until well combined. Mix in the flour until just combined and spread in baking pan. 2. Using an electric mixer, beat together the cream cheese, egg yolk, sugar, and vanilla in a small bowl until smooth. 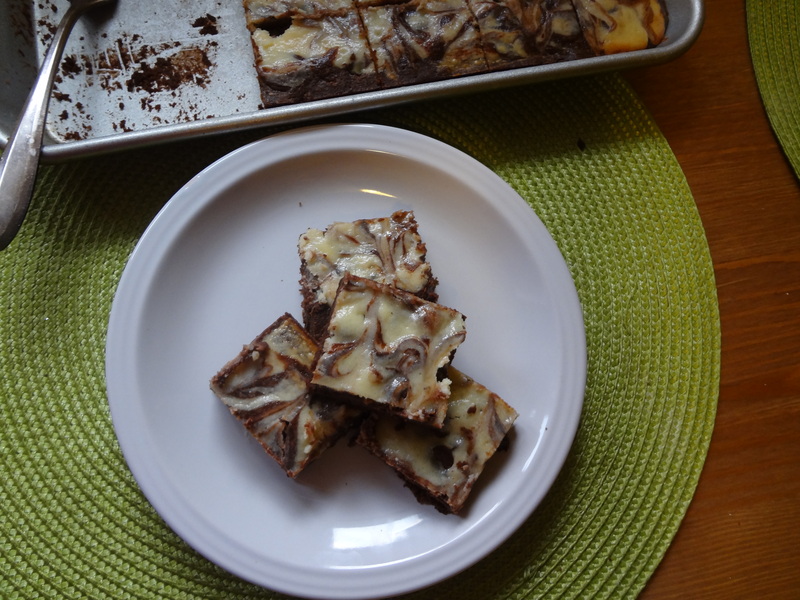 Dollop the cheesecake mixture over brownie batter, then swirl in with a butter knife. Baker’s note: I drag the knife through vertically in rows through the entire pan, then switch to horizontal dragging to complete the marbling. In some places I had to fold in the cheesecake layer a bit to more evenly distribute it. 3. Sprinkle chocolate chips over cheesecake/brownie batter swirl. Gently press the chips into the batter. 4. Bake the brownies until edges are slightly puffed and center is just set, about 35 minutes. After removing them from the oven, let them cool for about 20 minutes and, if serving immediately, pop them in the freezer for another 10 minutes before slicing with a heated knife (run your knife under hot water for 30 seconds). This gives you a cleaner cut. 5. Refrigerate any left overs for up to one week. 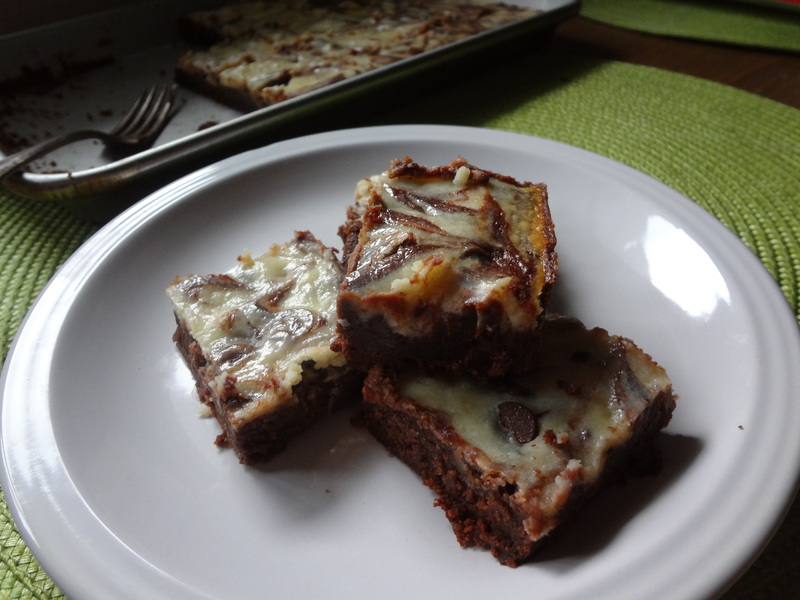 This entry was posted in Uncategorized and tagged Brownies, Cheesecake, Chocolate, Chocolate Chips, Dessert, Fast and East, Ooey Gooey by theculinarycapers. Bookmark the permalink.